Arsenal’s dragged out contract issues with Mesut Ozil and Alexis Sanchez this past year was problematic for the club, and reports claim they could look to avoid a similar scenario from arising. Both players were on expiring contracts, but while the German playmaker signed a new deal, as per BBC Sport, Sanchez was sold in January with Henrikh Mkhitaryan joining as part of the deal with Man Utd. 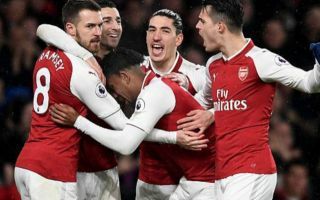 Things arguably worked out quite well for the Gunners in the end as they also brought in Pierre-Emerick Aubameyang, and so they certainly have enough firepower moving forward. Nevertheless, leaving it so late to agree new terms with Ozil while negotiating Sanchez’s exit would have weakened their position and in terms of long-term stability for the club not knowing if their best players were going to stay or not, it was a far from ideal situation. According to The Sun, the Gunners are not willing to see that play out again, and so it’s claimed that if midfield ace Aaron Ramsey doesn’t make progress in talks before his current deal expires next year, he could be sold with a £40m valuation provided and both Man Utd and Chelsea specifically mentioned as interested parties. Arsenal will surely want to keep the 27-year-old, but ultimately this has to be the stance that they take in order to put themselves in a strong position and have a sense of control. Ramsey has been an important figure for the club this past season, scoring 11 goals and providing 12 assists in 32 appearances in all competitions. In turn, Arsenal will ideally want him to commit his future and stay with the club as they prepare to appoint Arsene Wenger’s successor this summer. However, should contract talks continue to stall and with his expiring deal in mind, perhaps they’re right to reportedly consider a sale, albeit they’d surely want to avoid seeing him join a direct Premier League rival.